The Eternal Burning Shithead. 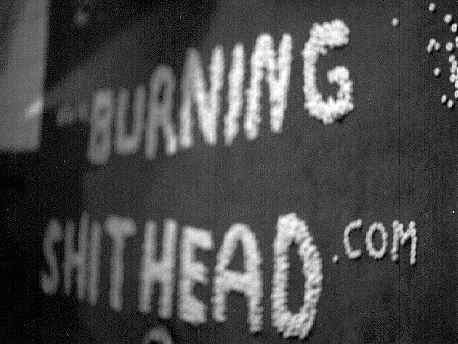 In our lobby, we make it a point to always keep a pile of burning shithead that spells burning shithead. Somewhat like the eternal flame (but probably more like John Malkovic going into John Malkovic's body in the movie Being John Malkovic), this is burning shithead burning shithead. Secure Development Procedures - In a move designed to enhance the security of the Burning Shithead content, and to protect the content of our partners and contributors, we have a "laptop development only" policy, which ensures that our sensitive data is connected realtime to the internet only when an employee is transferring code to our secure servers. Before connecting to transfer this encrypted code, employees are required to transfer all files from the laptop computer to temporary media such as CD, diskette, or ZipÔ drive. Our Data Center - We use a Sever, PC, and DSL Modem leased from PacBell (with connectivity and other internet services) - the OS for the server is FreeBSD, and we use a variety of rendering tools to tweak our presentations and images for maximum downloading convenience (we'll be ready to support mobile and xml in a variety of ways). This DSL connection has had consistent throughput over 1MBPS and has had excellent uptime. Given current performance metrics (see next section) we anticipate needing to move to a tier I hosting facility soon. Command Central - this is where network monitoring tools and alarms constantly monitor the load and performance on the BSH site. Secure analog handset telephones (pictured) on land lines are standard.